Lately, I have been spending most of my time on a movie house. I can’t help not to watch those movies that caught my attention. One of those is “Talk Back and You’re Dead”. 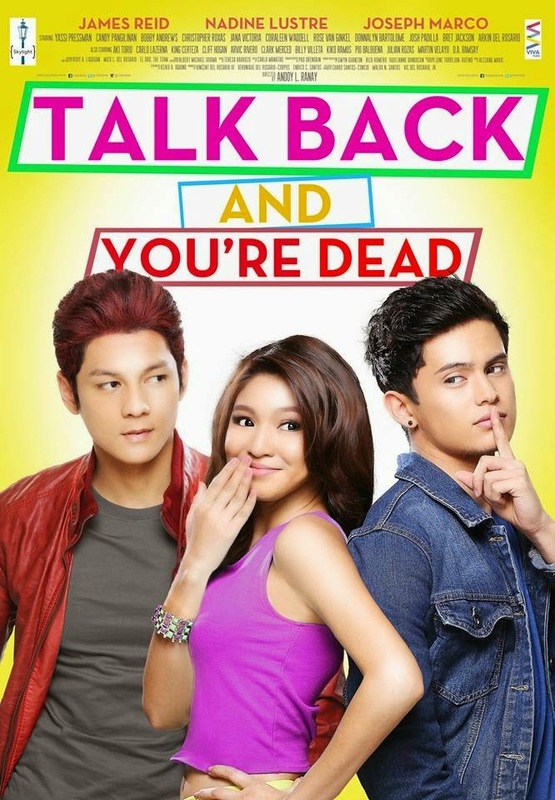 It is a story from Wattpad by Alesana Marie that turned to a book and now a movie. Well, at first I did not expect anything. I thought it would be too corny for my taste but it was not. It was funny, romantic and has a little bit of action. The story started with the two cute chubby kiddos making a promise with each other. Fast forward to the present, Miracle Samantha Perez (Nadine Lustre) confronted Timothy Odelle Pendleto aka TOP (James Reid) to help her friend which everyone saw and took some videos. Then, they posted it on social media. The next day, the lucky 13, the gang headed by Top, was looking for her. The rest of the story should be watched on the movie theatre! James Reid is so hot! I can’t help to be ‘kilig’ when he is saying the romantic lines. Arg! I think I am not the only one who is feeling those kilig vibes because seriously some of the girls on the movie house are shouting because they can’t contain their kilig. Hahaha It was a feel good movie. I think some of the parts are not explained well just like the amnesia of Samantha and how TOP became blind at the end. Well, that explains why they have a short teaser on the last part of the movie. Afterwards, “Never Talk Back to A Gangter” was flashed on the screen. Another movie for both of them! I can’t wait. I conclude, the missing parts of the movie will be shown on the next one, I hope!